Still a good read for those who love this world 3.5 stars. “You're the first Shadowhunter I've ever met." “That’s too bad,” said Jace, “since all the others you meet from now on will be a terrible letdown.”Jace's confidence is still as staggering as ever. We are thrust back into the life of the conclave a few months after the Mortal War. Clary is finally getting a the Shadowhunter training she needs. Alex and Magnus are off traveling the world together and Simon is trying to figure out how to tell Isabel and Mia he is dating them both at the same time. Life is going along well until the bodies of shadowhunters start being dumped around the city. Some of the things that made this not as great as some of the other books is that all of our favorite characters seem to be having some relationship issues. Jace is having nightmares about Clary and is trying to avoid her until he figures them out. Upside to that is the bromance between him and Simon. Although we miss the banter and magic that he has with Clary there still are comical moments with Simon. Alec is trying to come to terms that Magnus is immortal and has had quite a scandalous past well Camille Belcourt shows up. Isabel is so strong and fragile all at the same time but she gets to have some great one liners and seems to always walk in on Clary and Jace at the least appropriate time. We even get a few new characters that will probably be important down the line.There is a little more focus on the relationships in this book than in the previous action filled adventures. But, it did really pick up at the end when the true villain is revealed. That is the part of the story I enjoyed the most it was a good build up to the reveal.Just a few other side notes. I read all of TID before reading this and I was so happy when people and objects from the past showed up in the story. They were peppered throughout and I was like oh....there is Camille comparing the way Alec looks to Will, and oh oh oh Brother Zachariah I remember that guy. 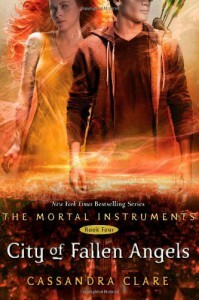 This is still a good read for those of us who love the Shadowhunter world (raises hand) but not my favorite in the series thus far. The ending set up nicely for the next book though and left us with quite the cliff hanger.